Oh my goodness I LOVE these guys! 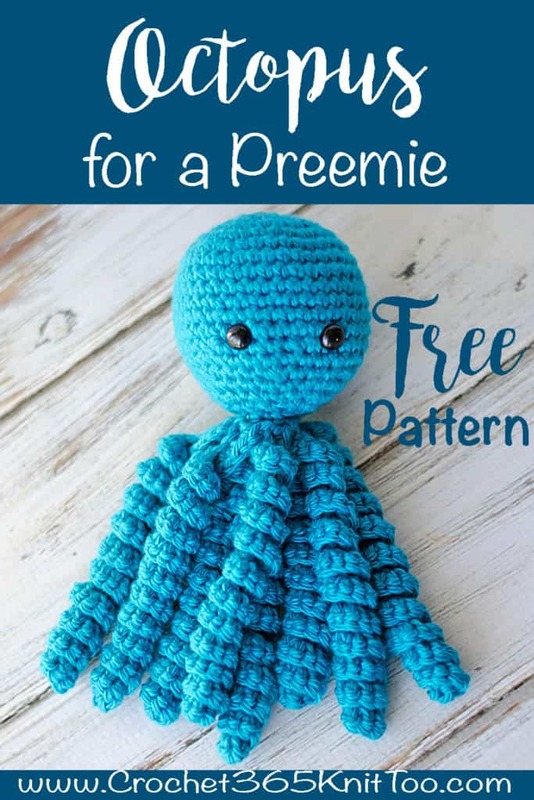 An octopus for preemies! So cute and so fun! If you’ve read the news lately, you may have heard about how these little octopi are comforting premature babies in neo natal units. You can read a great article here. A few years ago in Denmark, a father asked for a crocheted octopus for his baby. Hospital staff observed that the premature babies grasped the curly tentacles of the octopus instead of pulling at their tubes. The theory is that the curly tentacles mimic the umbilical cord and comfort the baby! What an amazing thought! Of course I couldn’t find an octopus pattern that was made just the way I like. I’m not a fan of sewing on extra pieces when I can crochet something on instead. I also like a round octopus head, but acknowledge that it really should have a slight oval shape as a nod to a real octopus. So my version has a slightly oblong head and a clever construction for attaching the tentacles. I used safety eyes, but you could embroider facial features instead. 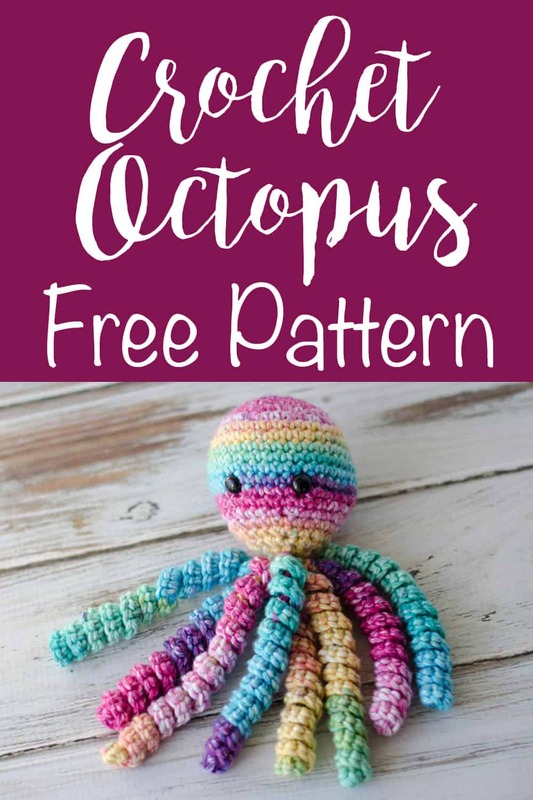 Making an octopus for preemies? A word about safety eyes. Some people feel that they are perfectly fine and very secure. If you’ve ever tried to remove them, you know they seem impossible to get apart once they are put together. But other people feel there is a small chance they could wiggle out in between the stitches. If they came out, they could cause a choking hazard. If you are making this with intentions of donating it, you should contact your particular hospital to get their requirements. Every hospital is different and has different rules for donated items. And, like any other toy for a baby or small child, please supervise and take any other precautions to put safety first. A small hook produces a tight finished product and no stuffing will show through the stitches (and no small holes for tiny fingers to slip into). 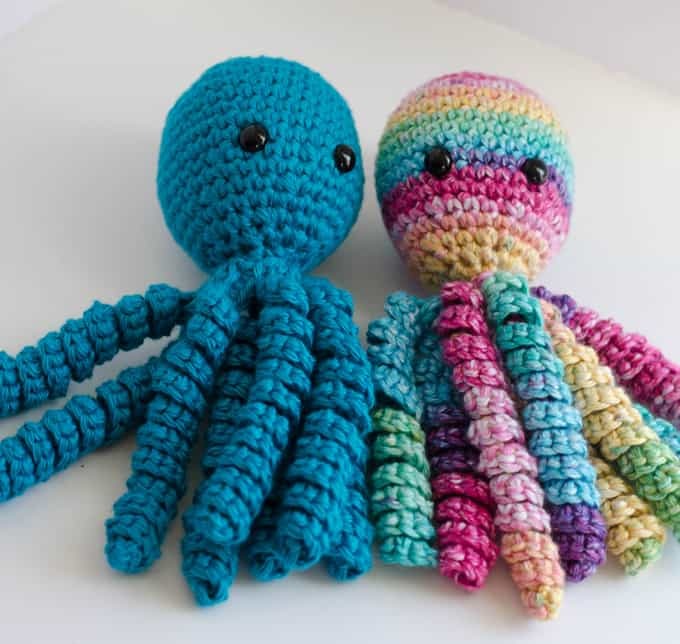 The tentacles are just the right length–long enough to be fun, but not too long for an octopus for preemies! With worsted weight cotton yarn and a C hook, make a magic ring. If you are using safety eyes, now is the time to attach them. Using 9mm safety eyes, attach between rows 12 & 13, allowing approximately 5 stitches in between, or whatever distance looks good to you. If you are embroidering the eyes for an octopus for a small child, do so after the octopus is stuffed and completed. R19: working in the front loop only, *sc in the next st, sc 2 tog, repeat from * around (8 st). *ch 50. sc in the 2nd ch from hook. 2 sc in ea chain across. When back to the body, sl st in the next stitch. Repeat from * 7 more times to make a total of 8 tentacles. Arrange the octopus so that the tentacles are overlapping the body/head and the open end is up towards you. You will be working in the free loops from row 19 which are now on the underside of your octopus. They can be a bit difficult to see, so just do your best and sc 2 together around. Fasten off yarn and then weave the yarn through the remaining stitches and pull tight. Here’s a slightly different angle of the octopus so you can better see how the tentacles attach. And voila! 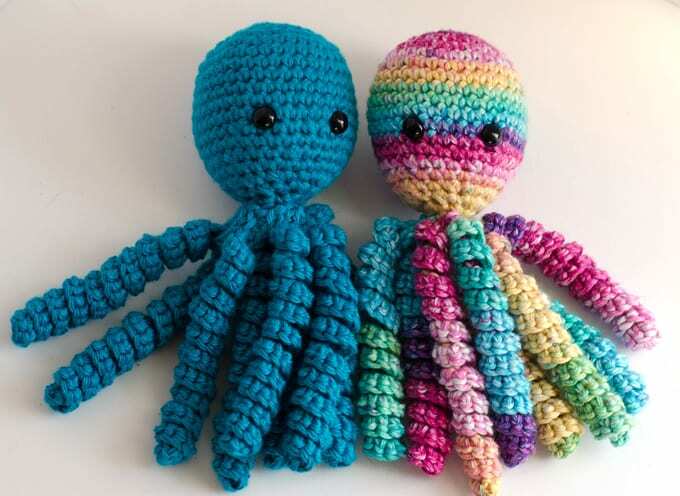 An adorably sweet crochet octopus to love! 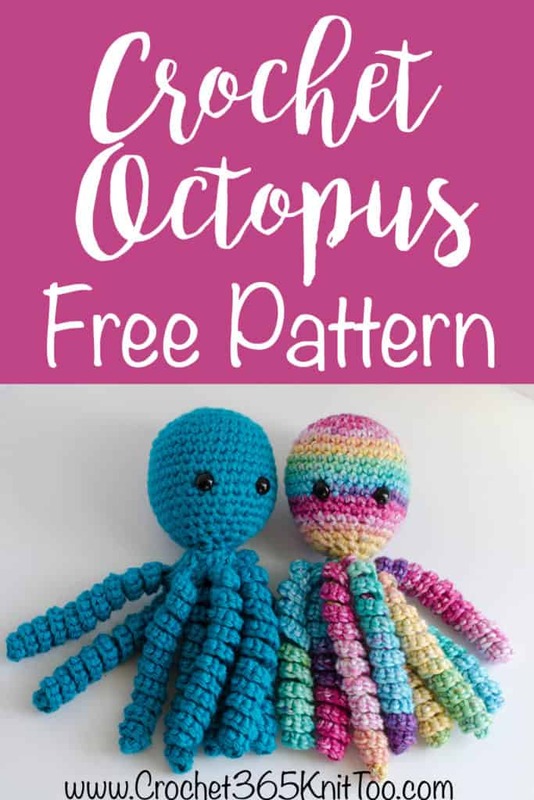 Looking for more FREE baby Crochet Patterns? Check out all the adorable patterns here! I love seeing your finished projects! If you share your Crochet Octopus for Preemies on Instagram, be sure to tag me @crochet365knittoo. If you are on Facebook, stop over to the Crochet 365 Knit Too Facebook page and share a photo! I’d love to see your work! Sign up for my weekly newsletter so you won’t miss a thing! Be sure to get your FREE Crochet & Knitting Journal here. Written pattern copyright Cheryl Bennett 2017, all rights reserved. Please do not reprint or repost this pattern. If you would like to share this Octopus For Preemies pattern with others, just link to this page. If you’d like to make items for sale from this pattern, please visit my About page for more information. I am a member of the UK branch and safety eyes are a definite no no. Please can you not recommend using them as they are a safety issue for premature babies according to trading standards. I’ve revised the post to reflect the concerns about safety eyes. Please note that when donating any item, one should contact the local hospital directly for their specifications. My local hospital, for instance, prefers the octopus unstuffed. And some of the “standards” set by various groups are not always necessary. It’s always best to contact your own local hospital or group and then make something that fits their standards. These are adorable, Cheryl. How large are they and could they be made larger (for older children) by doubling worsted weight yarn and a larger hook? Any suggestions would be welcome! Thanks! HI Becky, I gifted one of the octopus and the other is in my office at work (and I’m home at the moment). I’d guess the head is about 3-4″ tall from top to bottom. You certainly could make it bigger by doubling the worsted weight yarn or using bulky yarn–both with a larger hook size. You also could work a few more rounds of increases before working even (and then decreasing). 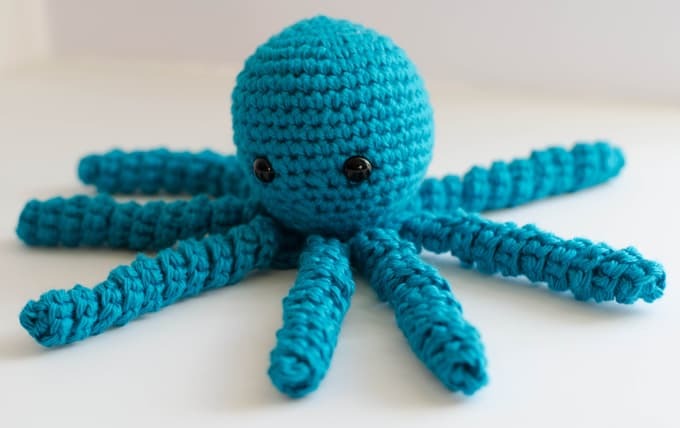 I’d probably separate the extra rows of decreases with a row of single crochet, so the bottom half of the octopus is more oval shaped. And then just decide if you want to add some chains for the octopus legs. Good luck! Can I ask why you use cotton yarn for these? Would wool be OK too? Cotton yarn is recommended because it can withstand the high temps to sterilize things in a hospital. If you are making the octopus to donate, you should contact the hospital to get their specifications. If you are not making the octopus to donate, then you have more wiggle room to make it out of any yarn you want. I am trying to crochet it, but having some problems. When i finish 6 stitches, do i have to do a slip stitch at the end. then when i go to next row, do i have make one chain? The octopus is worked in the round. What that means is that you work continuously; you do NOT slip stitch, chain 1, etc. Instead, just continue the next row by sc into the next stitch. I usually use a small scrap piece of yarn or a stitch marker to mark each round. Thank you for the pattern and easy to follow instructions. This pattern is fantastic! I’m a beginner, only made three other projects before this and learned to crochet less than two weeks ago. This was so easy to follow. My yarn was very chunky and I used 9mm needles but it still looked really good just following along as written. Thank you for sharing this, being able to complete something this adorable just made my day. Im having issues with the tentacles. Mine curled fine. No where as spiral as this but are curly. But they are super lonf compared to the head. I did the ch 50. And 2 sc in each st after the first part. Just didnt wanna spiral up lole this. I’m wondering if your chain is looser than my chain. You could try chaining tighter or use a smaller hook. OMG! I loved the picture when I got the email. So today, I crocheted it….I ABSOLUTELY LOVE IT. By the way, I usually don’t like stuffed animals but for some reason I wanted to make it. When I finished it, I realized I have to keep it. I did not put a face on it. Will you please clarify? Row 19 working front loop only. Is this the loop toward me on the right side or away from me on the wrong side? Also, I ended up with 9 stitches even after ripping and redoing. I’m not sure how. Thanks so much. This is a really cute design. I”m glad you like the design. Good catch on the stitch count on row 19. It should be ‘sc in next st, sc 2 tog’ around. That will give you 8 stitches at the end of the row. (I revised the pattern). When you work in the front loop, it is the loop towards you. Here is a post that explains the stitch parts: https://www.crochet365knittoo.com/parts-crochet-stitch/ Hope that helps! Your pattern calls for a c2/2:50 hook. I looked at your set on Amazon and there is only a 2.75 hook. And do I look for a steel or aluminum hook? I never knew there was a difference in the smaller hook! Help please! Thank you! I love these!!! Going to make one for my 4 month old granddaughter as soon as I can get some cotton yarn. Thank you so much for sharing it!!! ? ?